According to SPI Research's 2017 PS Maturity™ Benchmark survey, the true power of a CRM for service organizations can only be realized when it is integrated with a PSA solution. Best in class service businesses have found that an integrated PSA and CRM solution is the best way to bridge the sales and services delivery gap. 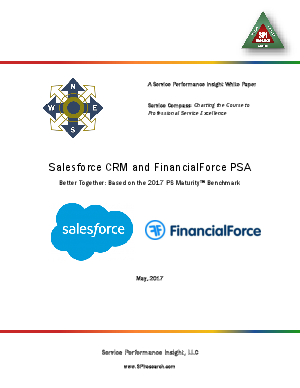 FinancialForce PSA, 100% native to Salesforce, enables sales and services to operate on one unified platform. Out-of-the-box and seamless integration is assured because both applications are built on the same development platform - providing bidirectional, real-time integration. This means sales has an up to date view of resource availability and project status while service delivery can see the sales pipeline to plan and staff upcoming projects accordingly.